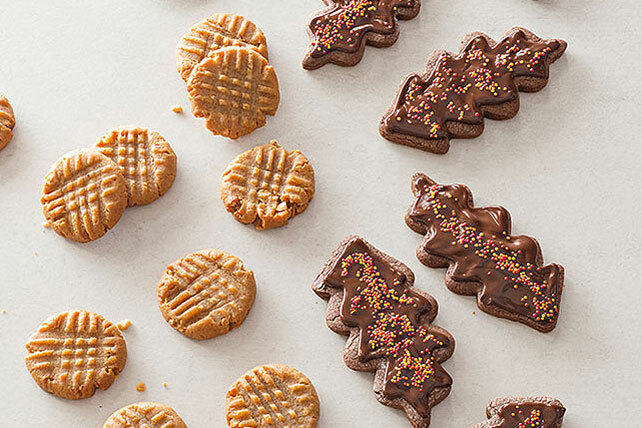 Prepare to wow the crowd with these Chewy Peanut Butter Cookies, made with honey-roasted peanuts that give them a gloriously distinctive flavor. Beat egg in large bowl with mixer until foamy. Add remaining ingredients; mix well. Roll dough into 1-inch balls; place, 2 inches apart, on baking sheet. Flatten each, in crisscross pattern, with fork. Bake 11 to 12 min. or until lightly browned. Cool on baking sheet 1 min. Remove to wire racks; cool completely. Instead of rolling the cookie dough into balls before flattening, use a 1-Tbsp. (No. 70) cookie scoop to portion out the dough for each cookie. Place cookie dough on parchment-covered baking sheets to prevent cookies from sticking to pans and to help keep baking sheets clean between batches.